Skokie Farmers Market: Enjoying the Local Language of Food. Skokie Market Manager Janelle Silva promoting her market love. Just outside of Chicago is the village of Skokie, a Potawatomi word meaning “marsh”. Skokie is ethnically diverse and its residents speak over 80 different languages. Yet there is one local language that brings them together on Sundays from June to November- and that language is food. The Skokie Farmers Market has been around for 42 years, and under the guidance of Janelle Silva, Skokie Market Manager, it has seen an influx of new faces and programs. What remains the same are the connections and good vibes existing at market. Join Skokie as the snap up our Instagram for the next two weeks! 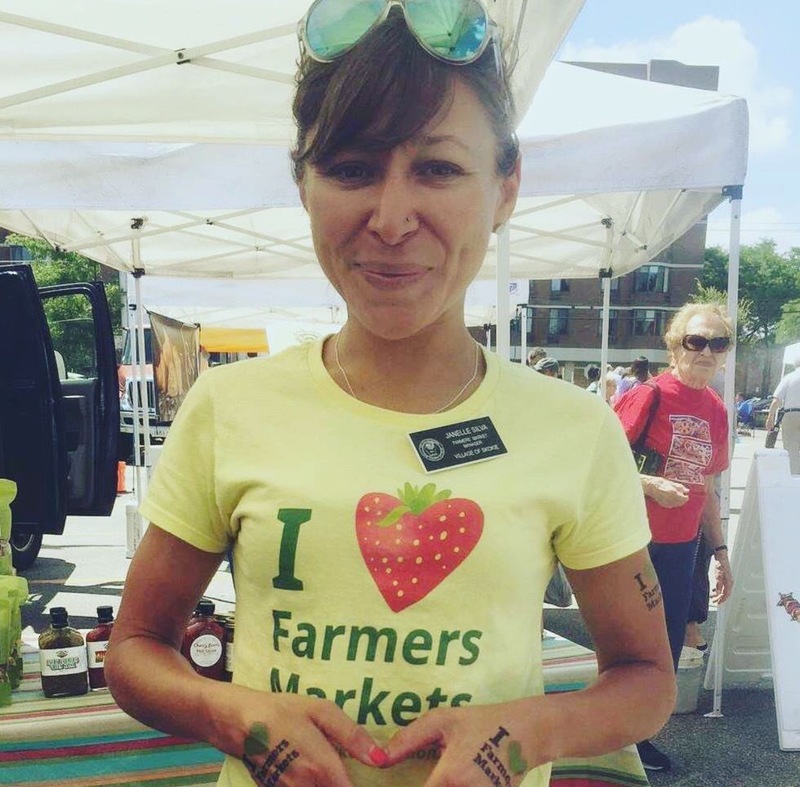 Janelle Silva: The first Skokie Farmers’ Market opened with a dozen vendors in June 1975 to serve the community and support local farming. The market is proudly sponsored by the Village of Skokie Consumer Affairs Commission and managed by a single paid staff person. The market supports local farming to bring fresh, nutrient-dense produce to the community and is a producer only market. The Market has steadily grown in size to host more than 2,500 visitors each week and many are weekly and yearly returning customers. We currently have 20-26 vendors present each week. New to the 2016 season was freshly prepared foods which included vegan kale burgers and fresh tamales. Families now linger at the market because of the fun family activities and fresh food offering with seating area for dining. JS: This outdoor market is hosted in Downtown Skokie and situated between Skokie Village Hall and the Skokie Public Library for 20-22 Sundays during the months of June through November. We are proud to share that two original vendors who started when the market opened in 1975 are still at the Skokie Farmers’ Market. The market serves Skokie’s modest population of 67,000 and the surrounding city of Chicago and suburban neighbors. It is one of the only Sunday morning Markets in the Chicagoland area, making it accessible to many who are religiously observant on Saturdays. Skokie’s is home to a multitude of cultures with over 80 languages spoken in homes, and makes the Skokie Farmers’ Market a beautiful and unique experience to shop local. JS: Programming and family activities were initiated heavily in 2015 and have really kickstarted the “I love Farmers’ Market” movement in Skokie. The market is municipally run and governed, which provides access to a lot of department presentations from the Village in a budget friendly way. For example, the Skokie Police Department provided tours of their mobile command unit at the market, the Skokie Fire Department hosted water demonstrations (which were fantastic on hot days! ), the Skokie Public Works department assisted with a “touch-a-truck” event, and the Skokie Health Department provided car-seat checks for infant and toddler seats. I connected with local restaurants to host chef demos as well, with tastings. The market also annually hosts a document shredding event which is very popular. This year we hosted our first ever pumpkin recycling event the weekend after Halloween. We also schedule local adult and student musicians in advance at the market to enhance the friendly, local ambiance of the market. *Include the summer and fall calendar of events in the municipal newsletter. *Create press releases for local media weekly during the market season. *Provide printed fliers of the summer and fall calendar at the market. *Post information on the Village of Skokie website. *Post information on the Village Facebook page (Shop Local Skokie). *Post videos on the Village Facebook page which include interviews with vendors. *Use a sign board for display at a municipal location which is at a heavy trafficked intersection within the Village. *Send information in the electronic newsletter through the Village of Skokie. JS: The Skokie Farmers’ Market has been in practice for over 35 years. The consistency with the season and day of the week helps tremendously. Skokie’s rich in diversity and is a family centered community. As a newer market manager I noticed that I was seeing the same people frequent the market. Which is a beautiful thing. However, I was not seeing many young families. I was afraid that the market was not drawing the attention of families with young children. Creating an appreciation for local markets, farmers, and fresh foods at a young age is what creates dedicated frequent shoppers as adults. My goal was to provide a connection for children and where their food came from. So I set to work. Creating many family activities and events, free to all. On a smaller scale, but still important, is the children’s area set up near the dining and seating area. The children’s area includes a child’s size picnic table, bubbles, hoola hoops, sidewalk chalk, etc..
We’ve since seen a grand increase in young families. I’ve been told the visit to the market has become part of their family routine on Sundays. JS: The Skokie Farmers’ Market also collaborates with the Niles Township Food Pantry on a weekly basis during the market season for the Produce Initiative. I work with the Commission on Family Services who volunteer to collect produce from the vendors at the end of the market day and deliver to the food pantry. Over 4,000 pounds of produce were donated in 2016! We also host Yoga on the Green! It’s a free all-level yoga session during the warmers months of the market season, held in the green space next to the market. It draws people to the market and helps feature a local yoga studio as well. We’re also working on rolling out SNAP! Stay tuned as grant results come in. This is major! Please keep your fingers crossed as my efforts to initiate this come to pass.